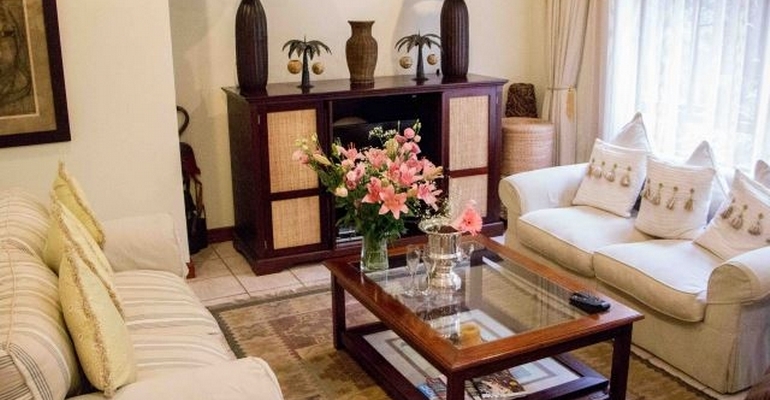 Forest Glen is a 3 bedroom holiday home surrounded by natural, indigenous forestry in Selborne Park Golf Estate with a secluded garden area - ideal for family holidays. The lounge is furnished with padded couches and chairs which face the TV cabinet. A large flat screen TV has full DSTV which ensures that guests won’t miss out on those important sporting events or favourite shows. Open-plan to the lounge is the Dining area with 6 seater dining table. A modern kitchen, fully equipped for self-catering requirements makes holiday catering a pleasure. Kitchen facilities include cutlery, crockery, kettle, toaster, microwave, stove, oven, fridge / freezer dishwasher and washing machine. The main bedroom has a fully tiled en-suite bathroom with shower, bath, toilet and double washbasins. The two guest bedrooms have built in cupboards, side tables and a double bed and twin beds respectively. The guest bathroom is fully tiled and has a bath, shower, toilet and basin.